In the summer of 2015, a group of friends started a campaign on social media. They wanted to make a difference to the situation for refugees in the north of France. 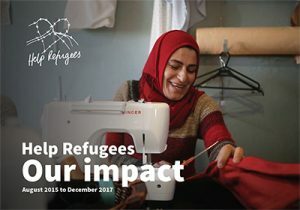 In the two and a half years since, this campaign has grown into a humanitarian charity that’s provided vital aid to 722,500 refugees across 12 countries. Since the summer of 2015, we’ve supported a network of over 25,000 volunteers, working flat out to provide food, clothes, shelter, medical care, psychosocial support and informal education to refugees across Europe and the Middle East. We’ve raised £10 million, 94% of which has gone straight to projects helping refugees. In a little over two years, our work has helped around 722,500 people. Sometimes it’s good to take stock. Our Impact Report, covering the period from our establishment until December 2017, does just this. In this report, you’ll find more information about the countries in which we work, our approach, our volunteers and the incredible impact that your donations are making to people’s lives. We believe that our work shows how ordinary people can step up and make a real difference to the lives of those in need. We hope you do too. Help Refugees is movement of thousands of everyday people, taking action to improve the lives of refugees. In a little over two years, we’ve grown from nothing more than a hashtag into one of the largest facilitators of grassroots aid in Europe. Read the our impact report and donate to enable our vital work to continue.